The long summer wait is over for the Virginia football team. The Cavaliers open preseason practice Friday night outside of the McCue Center in preparation for the 2018 season. The third season of the Bronco Mendenhall era begins with a 6 p.m. kickoff on Saturday, Sept. 6 at Scott Stadium when Richmond comes to Charlottesville. As the Hoos try to secure back-to-back bowl bids for the first time since 2004 and 2005, there are plenty of storylines to follow. Many of them have been discussed in the “99 Virginia Football Thoughts Before Kickoff” series so you want get a short list in this entry. Scroll to the bottom of the article for some of the key things to watch such as red zone offense, sacks, penalties, the importance of a fast start, and much more. You can also check back to this article following spring practice that addressed five big questions for the Hoos. 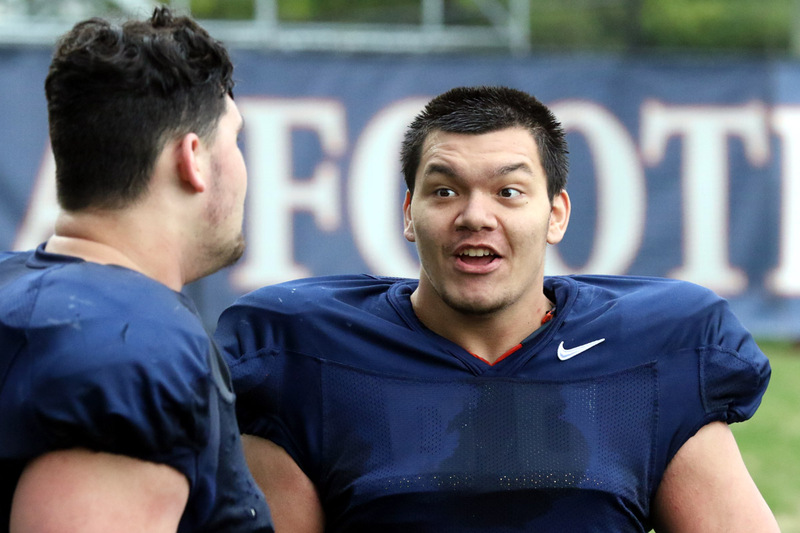 With that said, the “99 Virginia Football Thoughts Before Kickoff” series continues with some suggestions of players to keep tabs on during preseason practice. In the weeks leading up to college football season, various organizations announce players that are potential candidate for their season-ending awards. For example, the Augusta Sports Council announced Friday that UVA punter Lester Coleman has been added to the Ray Guy Award Watch List, an award that recognizes the nation’s best punter. Other examples include Joe Reed on the Paul Hornung Award Watch List, Juan Thornhill on the Nagurski Trophy Watch List, and Olamide Zaccheaus on the Biletnikoff Award Watch List. In the spirit of players to watch, here are few to keep tabs on during preseason practice for Virginia. These suggestions steer clear of some of the high profile players like Bryce Perkins, Thornhill, and Zaccheaus, though. Instead, here are some names that either need to emerge to help the Hoos’ quest for a bowl bid or players that could carve out a role unexpectedly. Lamont Atkins, running back. The sophomore came to UVA as the Virginia Gatorade Player of the Year. He played in all 13 games last season as a true freshman, mostly on special teams. He’s been through two spring practice periods already. He apparently plugs into spots similar to Zaccheaus. It will be interesting to see what Atkins does this season when more offensive snaps are expected to head his way. Cole Blackman, receiver. Sort of a forgotten man in his position group, could Blackman work his way back to playing time this season? Remember, Blackman appeared in four games as a true freshman in 2016, but then missed all of 2017 when he broke his leg in fall camp. He didn’t practice this spring either, but he’s cleared to go now. He’s yet to make a catch in a college game, but the Cavaliers are looking for players to step up with Andre Levrone and Doni Dowling now gone. It will be interesting to see how Blackman looks at the end of the long recovery road. Elliott Brown, outside linebacker. Another one of the 17 true freshmen that played in 2017, Brown appeared in 10 games last season and teamed up with Charles Snowden on some splash plays last season (a tackle for loss at UNC most notably). Still, Brown’s name doesn’t come up too much in conversation on the message boards or during media sessions. He might be someone getting snaps as a linebacker again this season, though, and he’s likely to be a key figure on special teams too. He partially blocked a punt at Pitt last season and recovered a blocked punt at Miami. Chris Glaser, offensive tackle. The Cavaliers will spend a large part of the preseason figuring out what the starting five for the offensive line will look like. The program reported that redshirt freshman Tyler Fannin will miss fall camp and that potentially sets off some dominoes. Fannin was a candidate to start at center, but now it looks like Dillon Reinkensmeyer will be the opening day starter there after holding that role in nine games last season. That means Reinkensmeyer is not available to start at tackle initially, which the staff considered a strong option before Fannin’s absence. Enter Glaser. He took a lot of reps at left tackle in the spring after he appeared in the final five games last season with two starts as a true freshman. For now, the first-team line could unfold as Glaser, Jake Fieler, Reinkensmeyer, R.J. Proctor. and Marcus Applefield left to right. Tavares Kelly, receiver. The 5’9” true freshman has gotten plenty of mentions this offseason even though he hasn’t practiced at UVA yet. That’s because he’s got a lot of speed, something that’s an emphasis for the coaches to get on the field, and plays receiver where some snaps may be available. Plus, the Cavaliers need to replace Daniel Hamm at punt returner and Kelly handled that job in high school. He’s just an intriguing player to watch ahead of the 2018 season. A.J. Mejia, kicker. Mejia won the starting placekicker spot last year as a true freshman and set a Virginia freshman record with 61 points kicking in 2017. Still, he made just 8 of 12 kicks and appeared to have range limited inside the 40-yard line (UVA hasn’t made a distance kick to date in Mendenhall’s tenure). Did he add distance and/or accuracy in the offseason? Can he hold off challengers for the job like Brian Delaney, last year’s kickoff specialist, and true freshman Hunter Pearson, who is reported to be out for the start of fall practice? Chris Moore, linebacker/safety. Last season, Moore shook off a mediocre spring practice period to carve out a key role during the 2017 season. He started five games and finished with 41 tackles and an interception. This spring, Mendenhall said Moore “just hasn’t been necessarily productive enough to draw attention” when asked about the junior. So is Moore repeating last year’s pattern of a so-so spring followed by a strong fall? The defense will be better if he does. Robert Snyder, inside linebacker. With Micah Kiser now in the NFL, a lot of snaps opened up at inside linebacker for the Hoos. Jordan Mack, who piled up 114 tackles alongside Kiser last season, will be an iron man again, but what about a running mate on the inside? Sixth-year senior Malcolm Cook will figure into the discussion, but Snyder is one candidate to pick up some snaps on the interior after missing last season with an injury. The coaches liked what they saw from Snyder in the spring. Zane Zandier, linebacker. Zandier appeared in all but one game in 2017 as a true freshman. He backed up Kiser for parts of last season, but that didn’t allow for a lot of game-day snaps since Kiser held such a large role for the program. The key now is to find the right fit for Zandier among the linebackers – he’s not listed specifically as an inside backer because he can play inside or outside. The Cavaliers need someone to spell senior Chris Peace and to hold down another OLB spot. Snowden is a name that usually comes up because he had some eye-catching moments last season and figures to be in the mix again this year, but Zandier is a candidate to find a role. Keep an eye on Matt Gahm too – he handled first team snaps with Peace out in the spring. Those are just a few names to consider. What about Cassius Peat and Dylan Thompson as transfers to the defensive line? Or the back-up quarterback battle between Brennan Armstrong and Lindell Stone? Is Tim Harris going to be a starting corner as a sixth-year senior? Share some of your players to watch on the message board!